“This year we were too late to participate in the Olympic Games” says Captain Onni Niskanen, who is joining us as the official representative for the Sports Federation in Addis Ababa. He has worked there, as a sports instructor and adviser, for two years and has had the contract extended for two more. 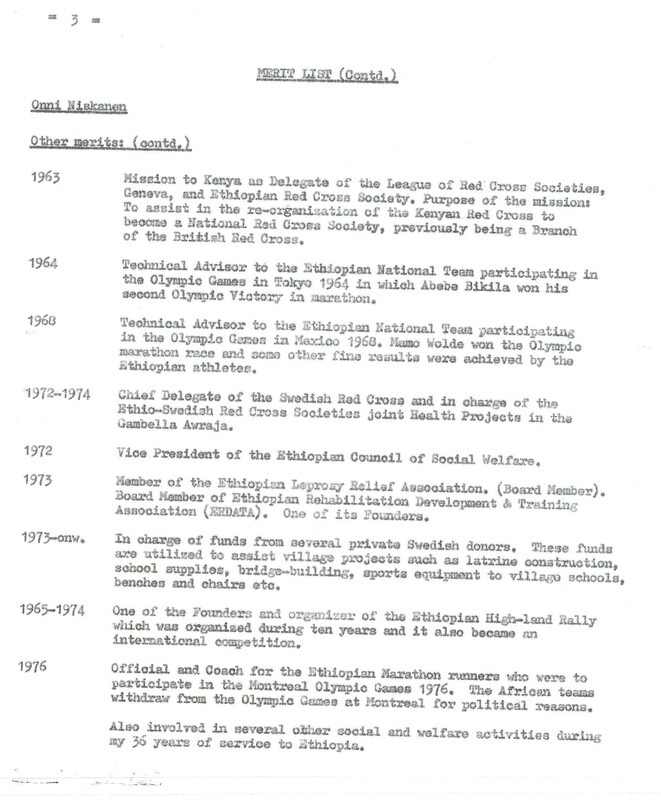 “I will inquire with the Olympics ‘bigwigs’ and, as soon as I get back home, I will start putting together an Ethiopian Olympics committee so that we can take part in Helsinki 1952. So far, I have worked solely in Addis Ababa, but in the future, my work field will be extended to include the countryside, where the great talents are and the human material is especially good. That is not an exaggeration, with the barefoot boys being able to run for days in all types of terrain. As a matter of course, they play football barefoot as well. It only just happens that they bind up their ankles”, Niskanen concludes. Below is part of an article published in the Swedish edition of Runner’s World No. 11, 2008, and is reproduced here with permission from the author. It all started at 2.000 metres altitude, in Ethiopia. That is where the foundation for the dominance in long distance running was laid. However, the Swede Onni Niskanen was also in this picture. He raised the first talents to become international stars. 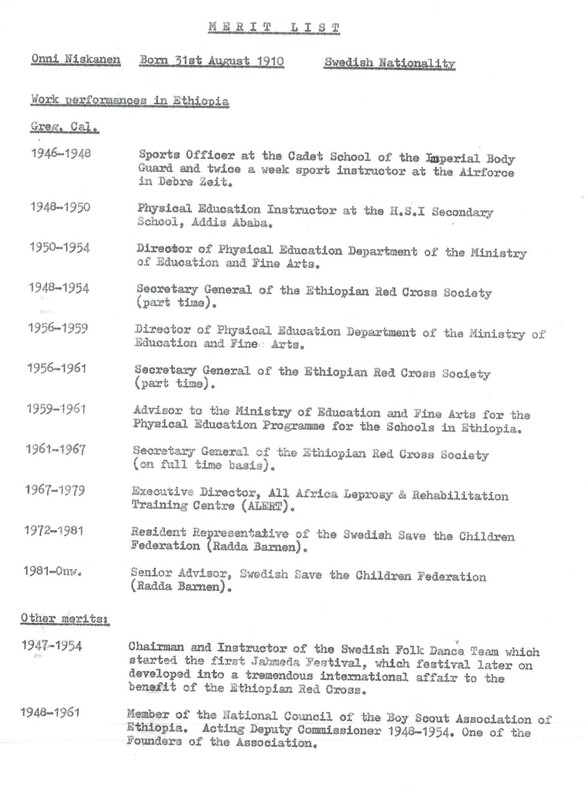 Abebe Bikila had a training based on Niskanen’s experience from Duvbo IK, GIH (The Swedish University for Gym Teachers) and Vålådalen. 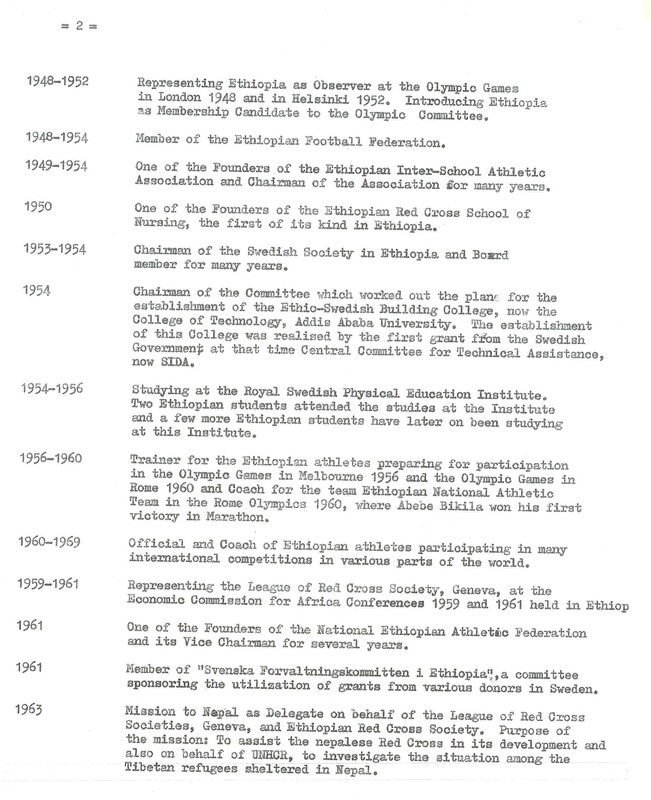 The Swedish broad athletics games were the model used when Niskanen organised the schools sports programmes and the Governmental activities in Ethiopia. This is the story how Ethiopia became so dominante in longdistance running in the world and still is. I wonder if there are any trainers and coatches that are so successfull as Onni was? In Februar 2010 there were an African film-festival in Stockholm. The vinner was The Athlete by Davey Frankel and Raseleas Lakew. It´s a film about Abebe Bikilas last five years. I did not know anything about the film before Ingrid, my better half, found it on the net. I contacted Dag Malmberg, the actor that play´s Onni Niskanen in the film and that was a beginning of a new friendship. We decided to meet at the hotel he stayed at before the film started and there we also met Rasselas Lakew, one of the producers and the main actor in the film. That was also the beginning of a new friendship. About the film I can only say I like it very much. It´s a fantastic story,almost Shakespeare… The greatest runner in the world have a car accident and become lame in the legs… The tempo and the photo is also very nice in the film. There are some minor mistakes about Onni but it does not matter much. 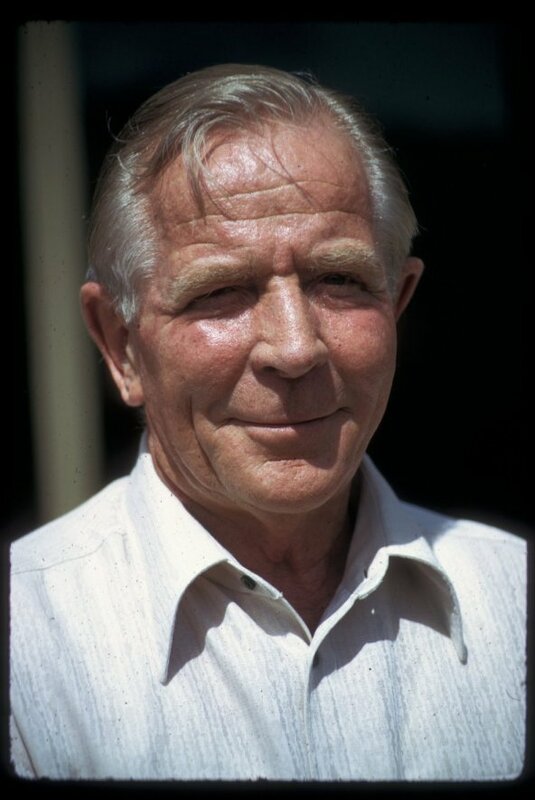 Dag Malmberg does not look like Onni, he is bigger, rounder and Onni did not have so long hair and he never had a hat but the film shows the strong bond between Onni and Abebe, almost a father-son relation. Dag told me one occurrence that happened during the filming in Ethiopia. he was sitting with three hundred walker-on waiting for their turn and he thought that he should introduce himself for them so he took help from an interpreter and told them that he was playing Onni in the film. Then they all raised and applaud him for several minutes. Dag was very taken by that episode. In September 2010 I was at the premiere of Atletu in the National Theater in Addis Abeba. That was a great experience. I also had an exhibition with images of Abebe Bikila and Onni Niskanen at the Theater. There is more to say about this film and what happened in Addis but some things are better remained unspoken. For Davey and Rasselas I wish nothing but the best for the future. In September we went back to Barbro and Bel to take part in their book fair in Mellösa. They also started the book town there some years ago. I am not sure if you will remember me. I am a British journalist who came to see you in Mora in 1997. 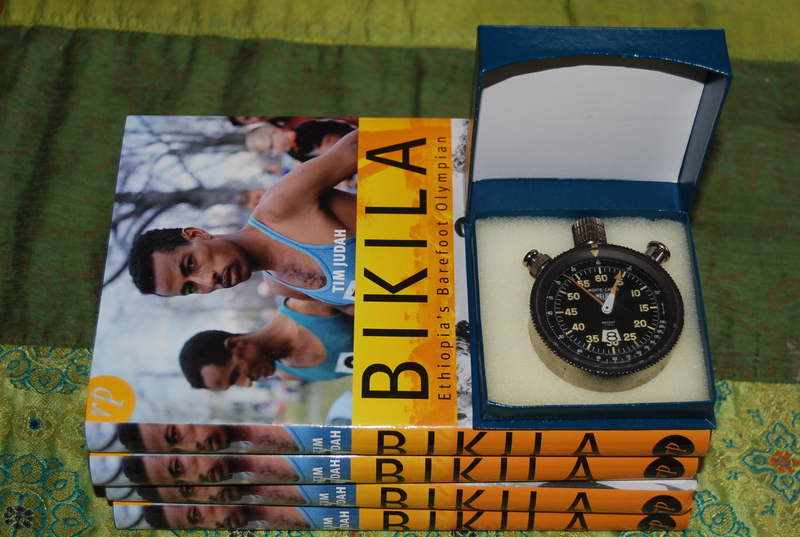 I had been asked by a French film company to research the life of Abebe Bikila and Onni Niskanen. You and your parents were extremely hospitable in receiving me and I have fond memories of my time with you. First of all I wanted you to know this. I tried several times to find you on the internet but failed. Then I got the idea to write to Marianne Sautermeister, who may have already told you I was looking for you. She told me the news about your mother so I would like to express my condolences for that. Please also pass my respects to your father. The book is almost done now but I think I will have some questions and so I was wondering if it would be ok to check some things with you? One important thing: I have quoted quite a few times from the book by Tsige Abebe and I would like to contact her for copyright permissions. I have had no success in finding her anywhere. Are you in contact with her by any chance? A portion of the proceeds of the book will go to charity. We have selected Swedish Save the Children, Ethiopia which was of course once headed by Onni. 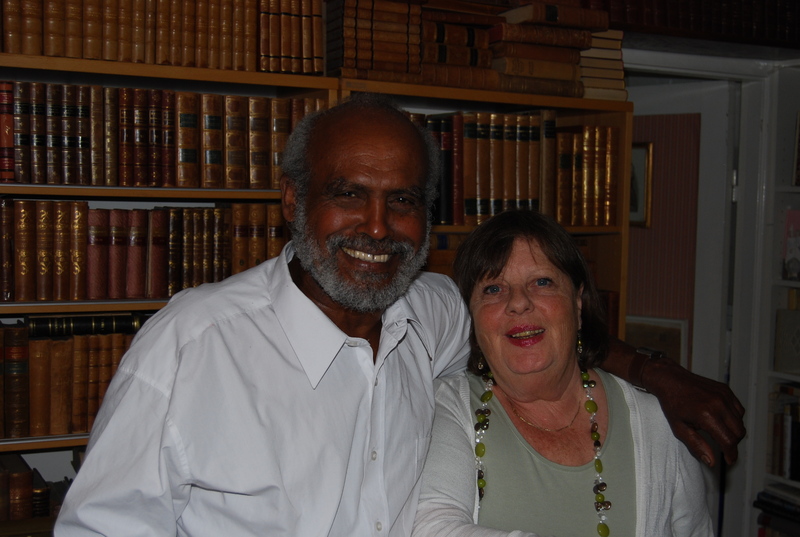 When his book, Bikila Ethiopia`s Barefoot Olympian was ready Ingrid and I was invited to the bookrelease in London. It was great fun and Tim told me that someone must write a book about Onni Niskanen and it has to be a swede that do it. This was the starting gun for me. When we came back to Sweden we started to intervju many people that met Onni and this work, documenting Onnis life has giving me so much. I have met fantastic people and went to places round the world because of “my uncle from Africa. This is what I want to share here with you!